Mr. Normand Rinfret is a seasoned executive who began his career in the education field but seized an opportunity over thirty years ago to work in health care. Passionate about improving patient care, making the hospital workplace a stimulating, effective environment and supporting research, Mr. Rinfret continues to use his business acumen, creativity and strong work ethic to build and maintain relationships and processes. 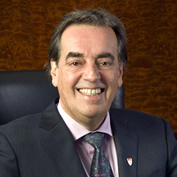 Before being appointed Director General and CEO by the Board of Directors of the McGill University Health Centre in 2012, Mr. Rinfret held the Interim Director General position in addition to his role as Associate Executive Director and Chief Operating Officer. He leverages the vast knowledge and experience he has developed in administration and governance, human resources, labour relations and government negotiations, as well as his service on a number of boards of directors, to influence and shape positive changes at the MUHC and, more generally, in the health sector.